Trekkies, Trekkers and all forms of Star Trek fans in Malaysia are up for an exceptional sci-fi experience at Star Trek: The Exhibition which has just transported over to Pusat Sains Negara (PSN) in Bukit Kiara, Kuala Lumpur. 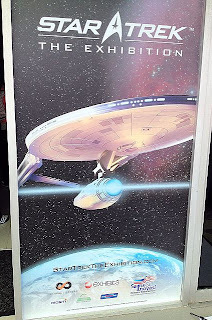 This official exhibition showcases a wide assortment of props, costumes, models and even replica sets from the entire Star Trek franchise covering 5 television series and 11 movies. 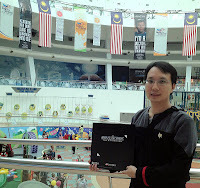 And miraculously brought all the way from North America to Malaysia from now until March 2013! Fans of our immediate neighbours in Singapore, Indonesia & Thailand can also arrange their away missions coming to PSN so as not to miss such a rare opportunity in this region of the world. 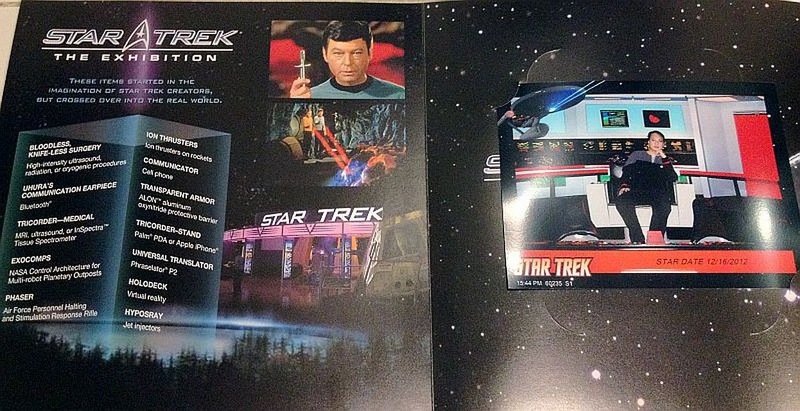 What to expect at Star Trek: The Exhibition? A survey mission was conducted on Stardate 16/12/2012 by our Away Team comprising Outpost Commander, Mr. Engineer, Lucas and a pilot of some Alliance from a galaxy far, far away. This scouting party visited on the soft opening weekend of the exhibition, coincidentally in conjunction with "Festival Sains 2012" whereby PSN was invaded by hordes of kids during this school holidays period. 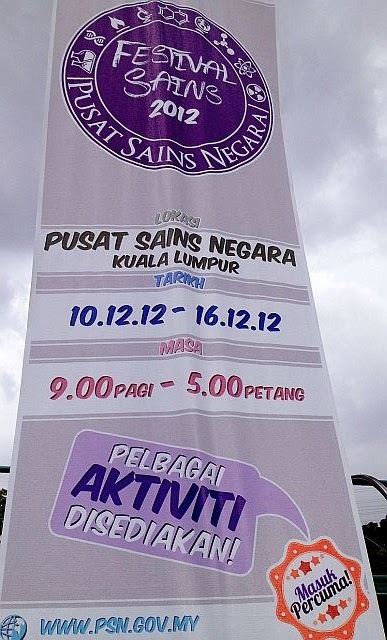 Fortunately this also provided free entry into PSN, otherwise there would be an entry fee of RM5-6 per adult. Check at the official PSN website for directions as well as opening hours and admission fees. As PSN closes at 5pm daily, Trekkies who want more time may wish to arrive earlier as our survey mission's 2+ hours was not quite sufficient to totally geek-out and read descriptions on every display. Star Trek perhaps suitable housed here as a sci-fi franchise that has inspired scientific inventions and creative thinking, e.g. Federation PADDs kinda looking like current iPads, right? 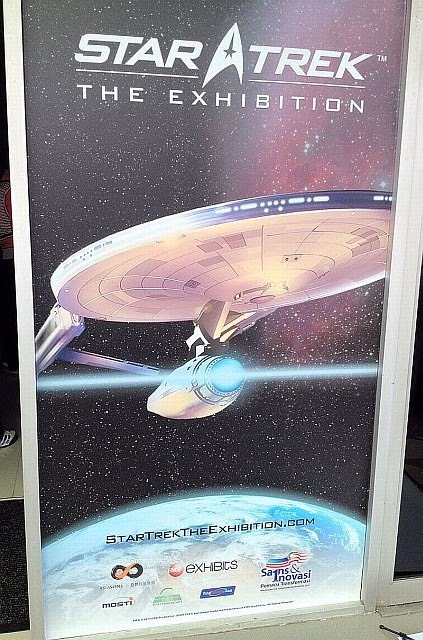 Star Trek: The Exhibition is located on the upper level of PSN. Just warp through the aquarium tunnel into the central atrium then make your way up the spiral ramp and follow wall signboards or floor stickers to the exhibit entrance. Entry fee is RM20 per adult and RM10 for students and children below 17, suitably affordable for an iconic franchise experience compared to theme parks or equivalent exhibits overseas where MYR is at currency disadvantage. Unfortunately own photography is not allowed in the exhibition so this survey report is respectfully deprived of visual information. More exhibition guidelines can be found at the official website by EMS Exhibits. SPOILERS: If you want to be surprised by the exhibition displays during your visit, do NOT read further! Upon payment, we received a small blue ticket stub with small print terms and conditions (no smoking, no photography, audio & video recording, etc.) and an exhibit "checkpoint" pass for photo-opportunity at 3 replica sets. The 1st set comprises only The Original Series (TOS) Captain's Chair of the Enterprise. 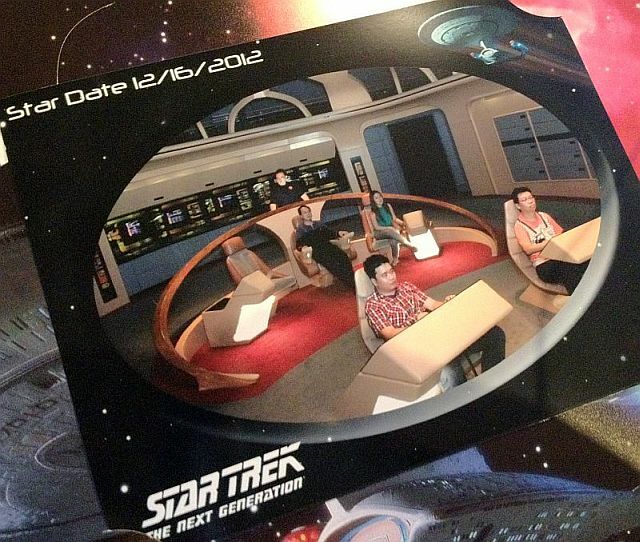 We were given opportunity to be photographed seated in the command chair whereby the TOS bridge background will be digitally added later. Surprisingly Captain Kirk's chair was more comfortable than it looks. Exhibition photo holder; Outpost Commander on TOS Captain Chair (right). 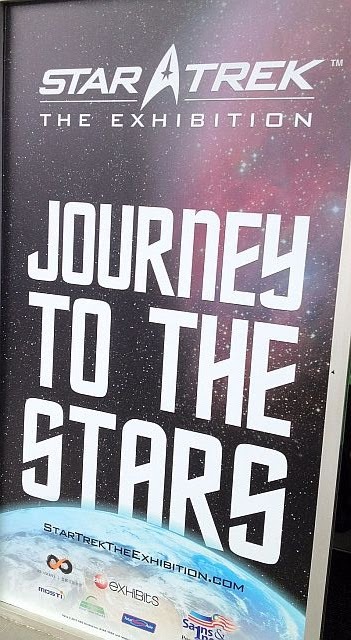 The 1st section of the exhibit comprises background of Star Trek, showcasing posters of the movies plus screenplay from The Next Generation (TNG) episode "Sins of the Father". There is also concept art from the movies & series, of which particular interest was concept art from First Contact depicting various types of Borg drones: Labour, Transport, Maintenance, Tactical, Assimmilation, & Medical. And it seems the Federation is mainly menaced by maintenance drones! The following section replicated a corridor from the Enterprise 1701-D adjacent to the Captain Picard's Ready Room adorned with props such as the Ressikan flute, Picard's dress uniform, Riker & Troi's wedding photo, a bottle of Chateau Picard, one of Data's paintings and a Hor Ga'hn. The 3rd section comprises displays of starship models such as the Borg Sphere, shuttlecraft, Federation starships NCC-1701D Enterprise & NCC-2000 Excelsior (model from Voyager series), and alien starships of the Klingon Vor'cha cruiser and Cardassian Hideki class corvette. There are also uniforms of the Captains from the 5 television series plus 2 Klingon thrones (not for sitting) and Bird-of-Prey's navigation chair. And check out of the wall of chrome ships named Enterprise starting from an aircraft carrier, space shuttle, the NX-01 Enterprise prototype, and so forth until the NCC-1701E plus starships from Deep Space Nine and Voyager. 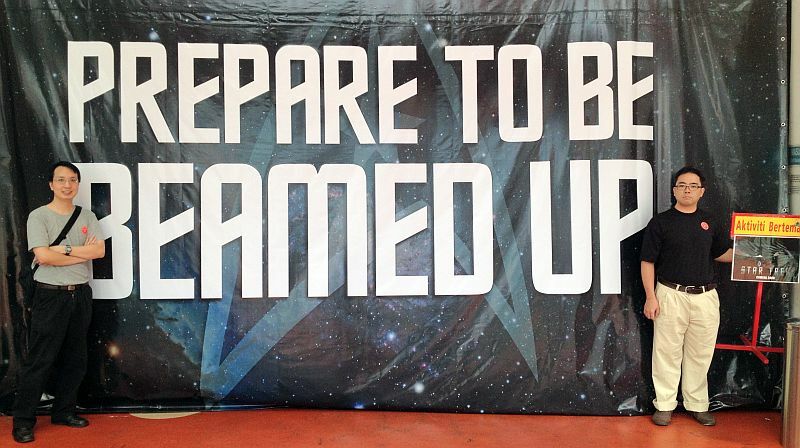 Take command of the Enterprise 1701-D! The major highlight of the exhibition comes next: a set replica of the Enterprise 1701-D bridge! And everyone is invited to sit at the various stations, including Captain Picard's command seat, for a group photo opportunity taken by the exhibitor's fixed camera. Our away team of 5 almost complemented all bridge positions: captain, first officer, counsellor, ops, navigation and tactical (there is really no chair for Worf!). Our Mr. Engineer also had a major geek-fest at the rear bridge stations with "working" monitors, as well as the tactical station by pressing the torpedo firing buttons. We highly recommend the next Away Team to come suitably attired in full Federation uniform (except maybe Troi's "bunny" suit) to takeover the corresponding bridge command crew stations. The Alien section follows with various head busts and video on make-up effects. There is also various props from TOS, such as the tricorder, and aliens, like Ferengi latinum. After a short walk pass wall of mirrors into the next hall, there is a chronology of major events from the Star Trek saga, starting from the prequal series Enterprise until the last TNG movie "Nemesis". Then follows displays of weapon props like Starfleet phasers & PADDs, and alien weapons. Costumers will appreciate the penultimate section of the exhibition, showcasing 42 assorted costumes from the saga. A quick but incomplete list of costumes include: Klingon & Romulan TNG uniforms, 7 of 9 jumpsuit, Ferengi clothing, Dabo girl skimpy outfit, EV suits from TNG, Reman soldier, Kai Opaka dress, General Chang's uniform, Garak's suit, Worf's uniform with bandolier, & 9 main cast uniforms from 2009's reboot. Energise! Lenticular photo beams us away! 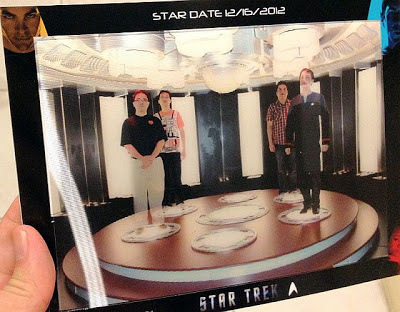 The final section provides the 3rd photo opportunity on the Enterprise 2009 reboot's transporter room. The exhibitor's photo options includes lenticular version whereby we can be seen to disappear from the transporter platform. Oh, there is also a large scale (11 ft?) model of the Enterprise 1701 refit to gawk at. Every exhibition would not be complete without chance to take home some souveniors, so there is a merchandise retail area just before exit. 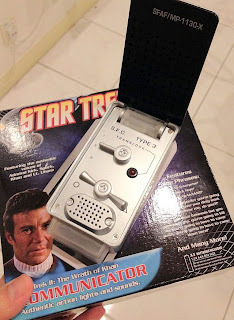 Most are not official Star Trek: Exhibition merchandise though, by there are some very rare finds such as Diamond Select Toys Wrath of Khan Communicator and even a Galoob TNG Type 1 Phaser from 1988! 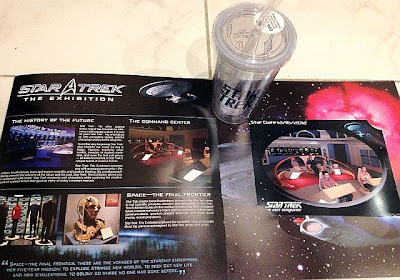 Yes, we geeked out a few hundred MYR on these goodies, but perhaps the more essential souvenior of the 3 set photos taken on the TOS captain's chair, TNG bridge and transporter room, sold as a set for RM25 with exhibition folder / photo holder. 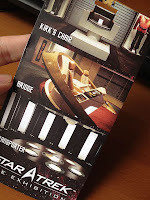 The lenticular photos for the transporter effect or 3D starship background can be added on for RM15 each. 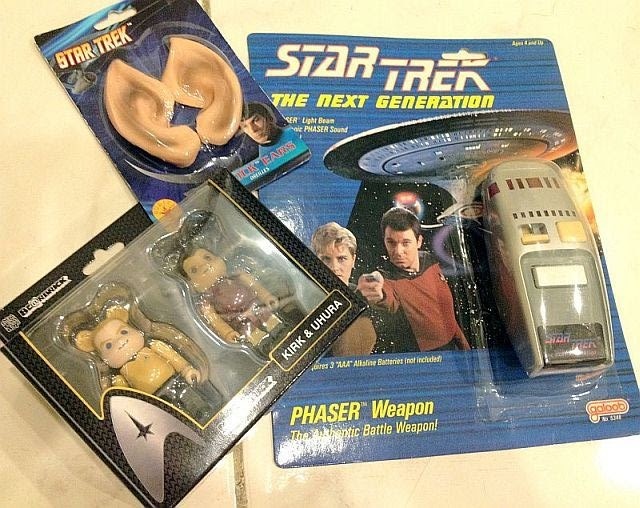 These all seem worth the latinum price for Trek fans! Wrath of Khan Communicator, priced at a real bargain on only RM50! 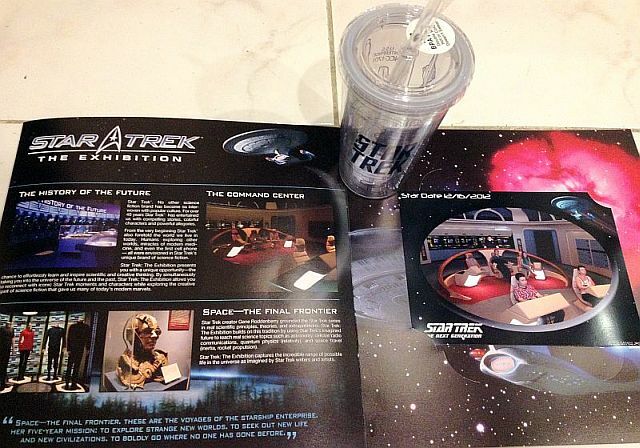 Another page in the photo holder with a Trek cold drink cup. To celebrate the arrival of Star Trek: The Exhibition in Malaysia, Outpost Events is giving away a pair of official Star Trek 6in action figures from the 2009 movie reboot. 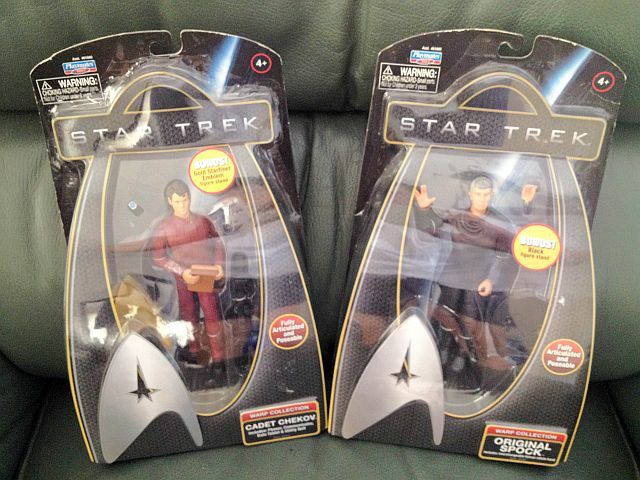 Just submit your entries via Punchtab below by 31 December 2012 for a chance to win toy figures of Original Spock and Cadet Chekov worth over RM130. Kindly note the giveaway is contingent upon this Blog receiving 20 Followers and the OutpostMY Facebook Page getting 1050 likes. So join now and get your friends to support this giveaway! Win these Star Trek prizes from our Holidays Giveaway! More Trek coming our way in May 2013 with Star Trek Into Darkness, the sequel to 2009's reboot movie staring Chris Pine as Captain Kirk and Zachary Quinto as Spock. After the crew of the Enterprise frind an unstoppable force of terror from within their own organisation, Captain Kirk leads a manhunt to a war-zone world to capture a one man weapon of mass destruction. Here's the latest high-warp trailer to tease your Trek fandom! Watch the latest extended teaser trailer on iTunes. 1. This online giveaway promo commences 18 December until 31 December 2013. 2. Giveaway becomes valid for award once 1050 Likes are achieve for the OutpostMY Facebook Page and 20 Followers join the Outpost Events Blog. 3. Participation is open to all residents in Malaysia ages 18 years and above. Outpost Events personnel are not eligible to particpate. 4. Winners will be randomly selected amongst qualified participants with correct answer to question. 5. Winner will notified within 7 days of promo closing for prize collection. If the winner does not response within 14 days of notification, the giveaway may be awarded to next qualified participant. Postage charges may be required if giveaway hamper cannot be personally collected. 6. Outpost Events as the organiser reserves the rights to change these terms and conditions without prior notice. Disclaimer: Star Trek and its trademarks are copyright to their respective owners, referenced here for fan service announcements without intent to infringe. WOOAAAARGGGHHHHHH!!! I wanna take half-day leave off work to go there NOW!! !